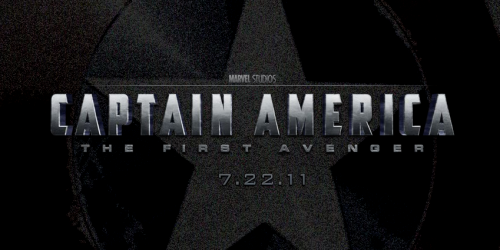 An unofficial blog following the Thor movie adaptation with a May 20th 2011 release. Then the cam­era flies up into Asgard, pan­ning around a huge gold, Jack Kirby-ish palace in which Odin is cas­ti­gat­ing Thor for being rash, dis­hon­or­able, self­ish and bring­ing war to Asgard as a result. Thor, kneel­ing before Odin (Anthony Hop­kins), wears his hel­met (looks good!) but Odin bel­lows his anger at Thor and casts him out of Asgard. Then the thun­der god is lying in the dirt when he’s found by Jane Fos­ter (Natalie Port­man) and her assis­tant Darcy (Kat Den­nings). Thor opens his eyes and grum­bles “this is Earth, isn’t it?” The women take him in and Darcy cracks wise while ogling the god: “for an insane home­less man, he’s pretty cut.” There’s dia­logue about Fos­ter and her team being on the verge of some dis­cov­ery and Thor promises that she’ll find what she’s look­ing for if he gets what he wants. That’s the ham­mer, and we’ve got to sur­mise that Coulson’s inter­ro­ga­tion comes after Thor broke into the com­pound to retrieve the ham­mer. But when we see him approach and attempt to lift it, he fails. Voiceover from Odin, “Whoso­ever lifts this ham­mer, if he is found wor­thy, shall weild the power of Thor.” The young god is obvi­ously not yet worthy. 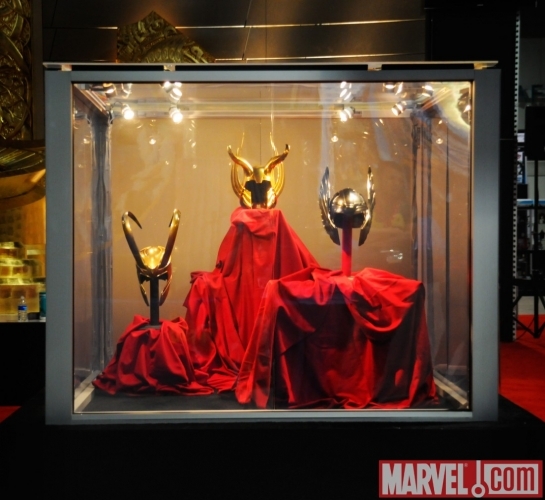 That leads to images of Loki tak­ing over Asgard and a swirl of com­bat footage — the War­riors Three bat­tling some threat to Asgard, chaos in the New Mex­ico town where Jane Fos­ter is work­ing and a big bat­tle between Thor and Loki. Voiceover from Odin says some­thing to the effect that Thor will have to face what’s com­ing to him. And that’s when the kicker comes in: Destroyer, a huge metal beast, lands in New Mex­ico. 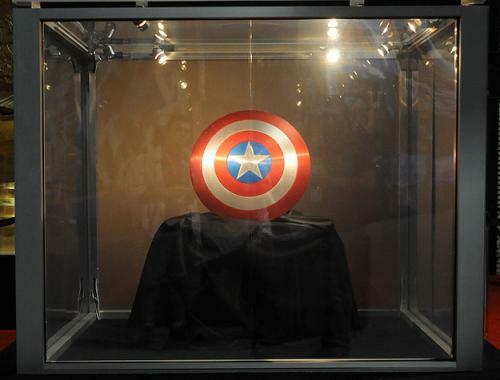 Coul­son and other SHIELD agents con­front it, with one agent ask­ing if it’s one of Stark’s. Then the Destroyer’s face opens up and unleashes fiery hell on the agents. 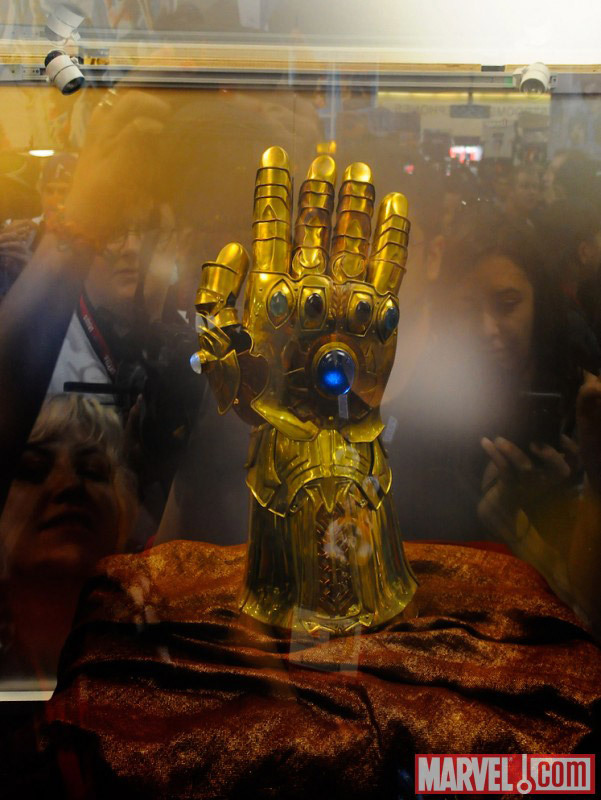 We were just shown some amaz­ing footage from Thor which really gives us a great idea of the story. It starts with light­ning and then it shows a S.H.I.E.L.D. base where Clark Gregg’s Agent Coul­son is inter­ro­gat­ing some­one chained to a chair. It’s Chris Hemsworth’s Thor, and Coul­son gives a long mono­logue ask­ing him where he got his train­ing. We see a bit of footage of Thor in action sans ham­mer tak­ing down the S.H.I.E.L.D. sol­diers who are try­ing to stop him. “Who are you?” asks Coul­son and Thor looks up. 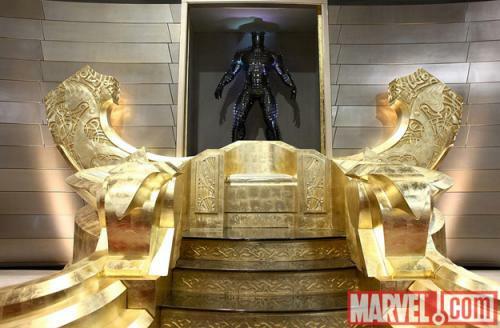 We then see what looks like a con­stel­la­tion sys­tem and we hear a voice-over by Anthony Hop­kins as Odin as we see the golden build­ings of Asgard and the cam­era goes into the throne room where he’s giv­ing a big speech to his son, who is kneel­ing at the base of the throne. We see glimpses of each of the Asgar­dian Gods includ­ing Sif, Balder and the War­riors Three, and Idris Elba’s Heim­dall. Odin is obvi­ously mad at Thor and he says that he’s going to take his power and ban­ish him for his actions, send­ing a bolt that sends Thor down through the con­stel­la­tion where he lands in the desert and is found by Natalie Portman’s Jane Fos­ter. We then see Hemsworth walk­ing around shirt­less and impress­ing Fos­ter and her assis­tant Darcy (played by Kat Dennings). At SDCC Mar­vel has unveiled the hel­mets of Loki, Odin and Thor. http://​thor​.mar​vel​.com/ and http://​cap​tainamer​ica​.mar​vel​.com/ are now live, no con­tent yet though. 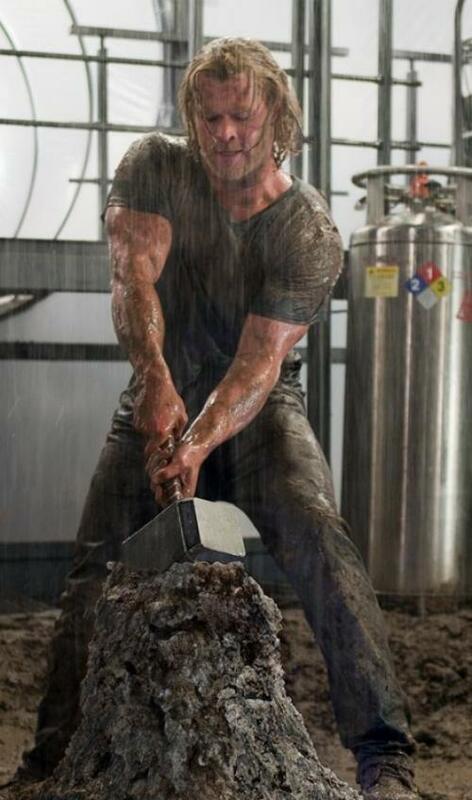 Mar­vel stu­dios have released another image of Chris Hemsworth as Thor, this time pulling out his ham­mer Mjol­ner from a block of rock. This image first appeared in USA Today. New posters have been released as part of SDCC, click for larger versions. 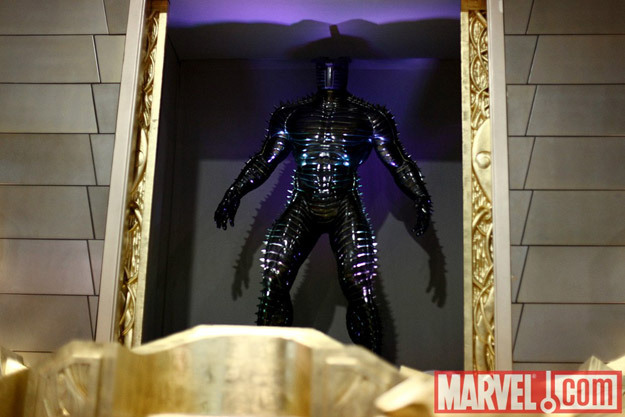 The Thor images are pour­ing in now, and from the LA Times we get our first glimpse of the Hall of Asgard, with Fan­dral, Hogun, Frigga and hel­mets. 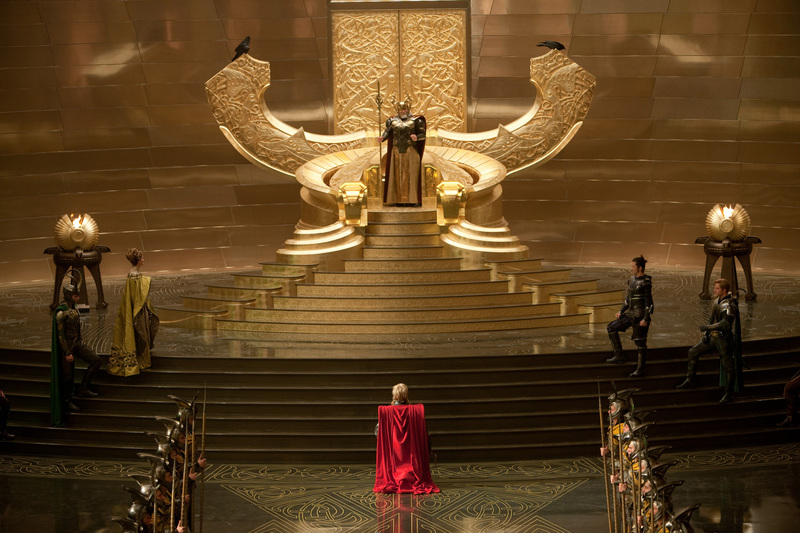 In detail, you can see a kneel­ing Thor (Hemsworth), then also Fan­dral the Dash­ing (Josh Dal­las), Hogun the Grim (Tadanobu Asano) and Frigga (Rene Russo); you can also see Odin (Anthony Hop­kins) and Loki (Tom Hid­dle­ston) with their cer­e­mo­nial helmets.